This versatile filter acts like a dimmer switch for your telescope, toning down the brightness of the Moon or planets to a level that is comfortable. The reduction in brightness and glare unmasks detail in your viewing subject and greatly improves contrast. 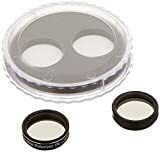 The filter consists of two high-grade glass polarizing filters in a rotating cell that allows you to adjust the amount of light transmission from 1% to 40%. Such control is highly desirable for lunar observing because the Moon’s brightness varies with its phase. The filter is great for terrestrial observing too, especially on sunny days. The filter has an anodized aluminum cell, which threads into the barrel of any standard eyepiece. Available in 1.25″ and 2″ sizes. Storage case included. This entry was posted in Astronomy Products and tagged 1.25inch, 5560, Filter, Orion, Polarizing, Variable by Celestial World. Bookmark the permalink.